The first phase of the Flight 93 National Memorial is under construction and on schedule to be dedicated on the tenth anniversary of 9/11 in 2011. An estimated 250,000 visitors each year will enter the Field of Honor through the Entry Portal along the Flight Path walkway. Set along the final trajectory of Flight 93, visitors will immediately be brought back to 10:00 am on September 11, 2001 when Flight 93 careened in this direction toward a stand of hemlock trees. After passing through the twin walls framing the sky, visitors will be standing at an overlook with a sweeping view of the Field of Honor. The Visitor Center will be located between the large concrete walls designating the Entry Portal and final flight path of Flight 93. The center will be the educational and interpretive hub of the Memorial. The drama and tragedy of Flight 93 will be chronicled using the latest audio and video technology, primary source materials, photographs, and oral history testimony from those who were there. Exhibits will go far beyond the story itself, creating a forum where visitors, families, and school groups can discuss the legacy of Flight 93 and what it means to be a hero. 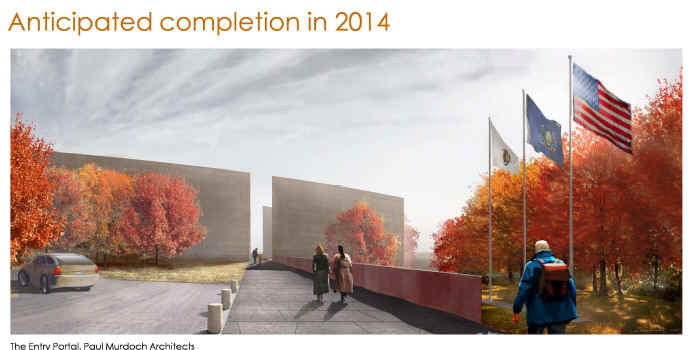 Major donors to the Flight 93 National Memorial Campaign will be recognized in the center. A large area just below the Entry Portal overlooks the western edge of the impact site of Flight 93 and provides a key vantage point to view the entire Memorial site. Years ago, the mining operations kept an equipment repair and parts shop at this location, and immediately after the crash of Flight 93, the Federal Bureau of Investigation set up its command post at this location. Foundations and floor slabs will remain to evoke the memory of the structures and location, where family members were first brought to view the crash site. Among the restorative features intended to heal the landscape of the site, a series of wetlands and ponds adjacent to the Sacred Ground will be preserved as natural features in the design and construction of the Flight 93 National Memorial. One of the “leftovers” from the surface mining activities, the wetlands will be transformed into a self-sustaining natural habitat and aquatic eco-system for local flora and fauna to reside and thrive. 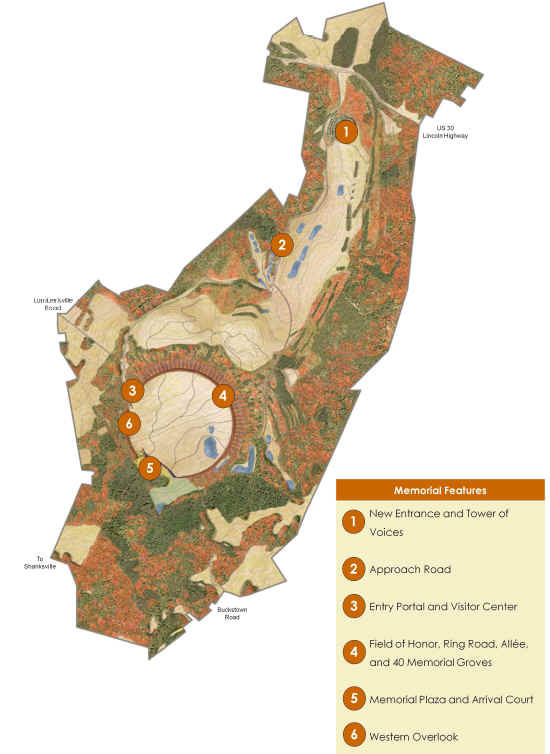 In addition to creating environmental interest, the ponds will serve important design functions as a naturally-occurring reservoir for irrigation and for storm water that will flow down from higher elevations. Creating a living memorial to the 40 Heroes of Flight 93 within the Memorial is the objective of planting the 40 Memorial Groves along the perimeter of one-half of the Field of Honor. Each grove will contain 40 trees, such as sugar or red maples, for a total of 1,600 trees that radiate toward the center of the Field. Concrete radials will subtly differentiate the groves, supplemented by recessed and other forms of lighting. Measuring one-half mile in diameter and covering over 150 acres immediately adjacent to the Sacred Ground, the bowl-shaped Field of Honor links the entire memorial through sightlines and pathways. Once a surface coal mine, the Field will be “rehabilitated” through the sustainable planting of native grasses and a mix of indigenous wildflowers. The Field will be framed by groves of maple trees and a walking path and road leading from the Visitor Center to the Sacred Ground. Tall enough to be seen from the highway, the Tower of Voices will mark the entry to and exit from the park. Reaching 93 feet into the sky, within resonating rings of White Pines, the tower will house 40 aluminum wind chimes. The continuous sound of chimes in the wind will be an audible reminder of the selfless acts of courage of the passengers and crewmembers; many of whose last contact on Flight 93 was through their voices on phone calls. From SOMERSET: from Exit #110 of the PA Turnpike, follow signs for Rte. 281 north. Take Route 281 north 9.5 miles to US 30/Lincoln Highway East at Stoystown. Travel 2.4 miles east on Lincoln Highway (US Rte. 30) to Lambertsville Road; turn right. Travel approximately 3 miles on Lambertsville Road to Memorial entrance; Turn left. From JOHNSTOWN: Take Route 219 South 9.6 miles. Exit onto Route 30 East at Stoystown/Jennerstown Exit. Travel 7.2 miles east on the Lincoln Highway (US Rte. 30). Turn right onto Lambertsville Road. Travel approximately 3 miles on Lamberstville Road to Memorial entrance; Turn left. From the EAST on PA TURNPIKE: Exit Bedford (#146) — At Turnpike light, turn left. Go to next light, turn left. Take 220 South. Follow 220 South to next exit. Exit US 30 West. Follow US 30 west approximately 25 miles to Lambertsville Road (3 miles beyond Buckstown). Turn left onto Lambertsville Road. Travel approximately 3 miles to Memorial entrance; Turn left. From the WEST on ROUTE 30/Lincoln Highway: Turn right on Lambertsville Road, 2.4 miles east of Stoystown. Travel approximately 3 miles on Lambertsville Road to Memorial entrance; Turn left.